My thesis project ’Artventure’ is a learning platform for kids that uses a combination of traditional visual art learning activities with an augmented reality technology. It encourages kids to practice visual art skills, meanwhile having fun and developing their creativity. Kids can directly use their drawings in the game to influence the virtual characters and their story. It provides both intrinsic and extrinsic engagement, leading to learning through play. How could we design a visual art learning experience to engage children for long-term practice and encourage their persistence? There are three different touch points including: an IPad game, a tool card package, and AR experience. It provides the curriculum and connects the different level of classes which children could follow. 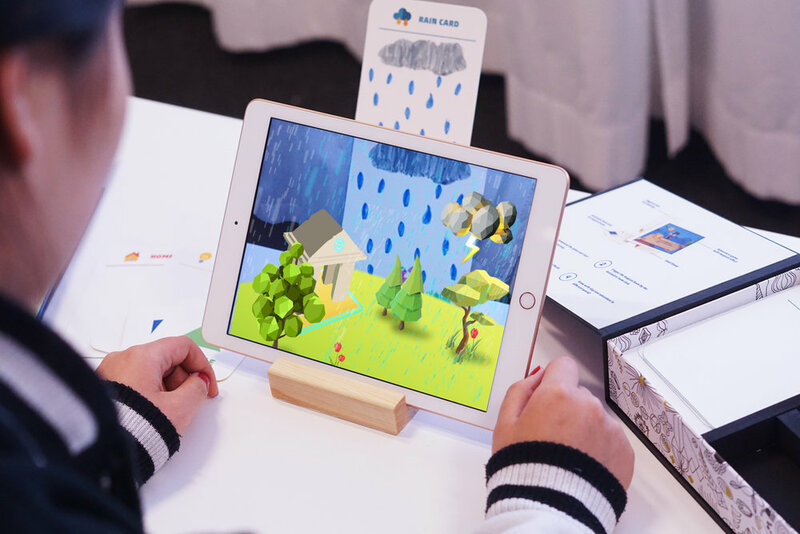 Children could play with the theory and explore the theory by using the magical tool card and AR experience. Children learn the visual art theory along the way of playing. The theory is a part of the game story. 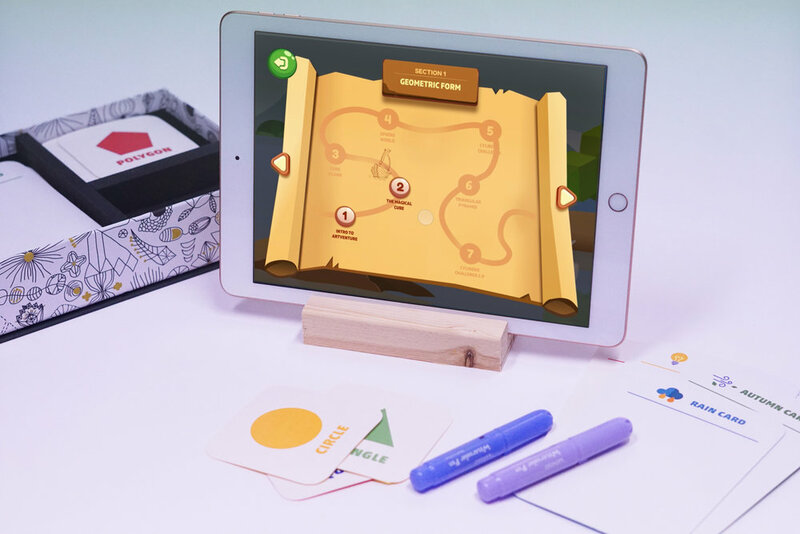 The design is keeping the traditional physical drawing activities, providing the tool card package with the cards that children could draw on that. It helps to encourage children to keep practicing in a way that is good for their development. The AR experience is connecting the digital game and physical drawing activities. Children can directly use their drawing in the game and influence the virtual characters and story lines. There are two types of experience in the design: the experience of long-term curriculum and the experience of single classes. The curriculum design is based on the K-12th the art learning standard in the USA. The experience of the single classes is based on the learning model: theory- practice- reflection. 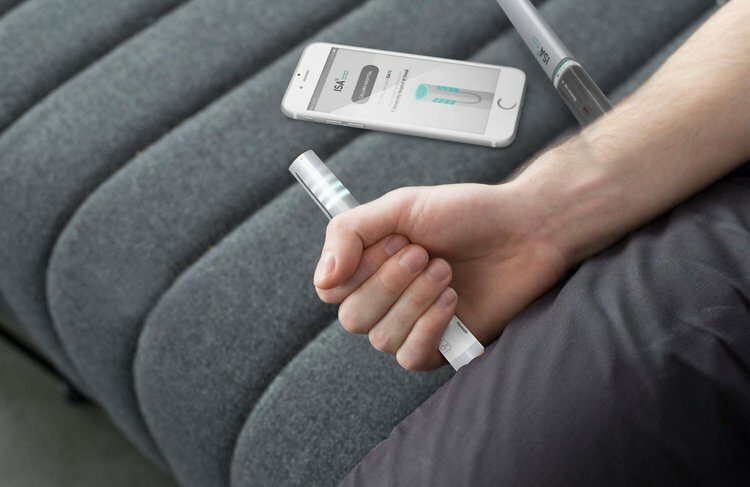 Keep the traditional drawing activities and add the digital touch point at the introduction and feedback parts. There are 3 classes are designed as the hero moments for showing how the concept works. The onboarding is the introduction to the game, the first class is learning how to draw cubes in perspective, and the second class is learning how to draw cones in perspective. To understand the current visual art education and kid’s engagement in the visual art context, I set up a series of research trips combined with the observations and contextual inquiries. The research was conducted in both China and Sweden. For my initial research, I interviewed over 17 people consisting of parents, visual art teachers, and experts. It helped me to better understand the current visual art education and the way parents and teachers are trying to engage kids in the educational context. I participated in 2 art workshops in Sweden and visited 2 different extra art schools in China. At there, I played a role as a teacher to create art together with kids. It helped me to understand the interaction between adults and kids and the interaction between the kids and their activities. When kids start to learn technical skills, there are more limitations and it is not as fun as before. There is a gap between creative classes and technical skill learning. Around 10 years old, kids start to be more critical of their artwork. They want to achieve realism and have higher expectations of their work than their younger peers. The workshop's focus was on exploring how kids perceive and engage with different mediums to do arts and to learn and what tactics can be used to create the engagement that could encourage kids to be more focus and motivated. In the stakeholder's workshop, the participants were asked to brainstorm on three design questions, in which they were given a persona or tactics to explore the possible concepts and scenarios. Based on the ideas from the workshops, I build the probes to communicate the early concepts. After that, 3 in-depth co-creation interviews were conducted. The aim of the interviews was to get the educators’ insights on whether the design can be useful in teaching and the engagement could encourage kids to draw more often. The prototypes are based on the learning model: theory- practice- reflection, and started from the experience of the single classes. There are three different aspects for achieving three different learning goals in the prototypes. In the prototype, I was trying to explore how we could make the theory learning more interactive. Children are no longer just sitting and listening, they could also explore the theory even play with the theory by themselves. 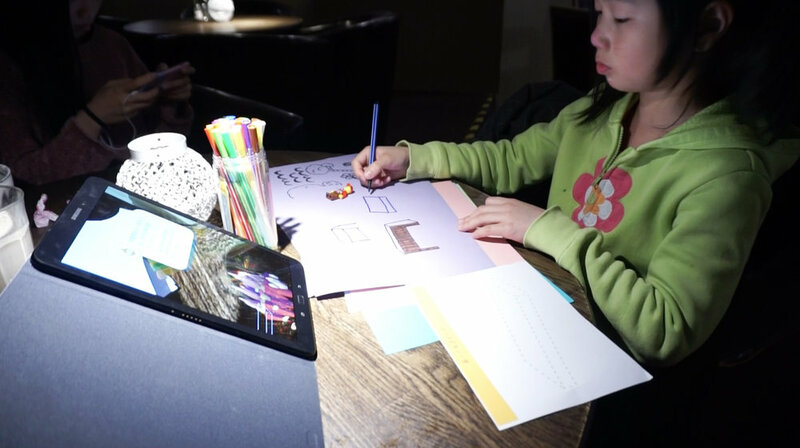 The design is trying to keep the traditional physical drawing, children get the mission while they are playing the game, but to finish the mission, they would need to draw on the paper and would use what they draw to influence the game by using the AR experience. I conducted qualitative user test with four kids in the focusing age group, 2 boys and 2 girls. All the kids show strong interest in this new format of learning and get very intrigued by the magical 3D content that they explore. What they love most is that they can interact with the game by the magical card and they can use their artworks to influence the story. 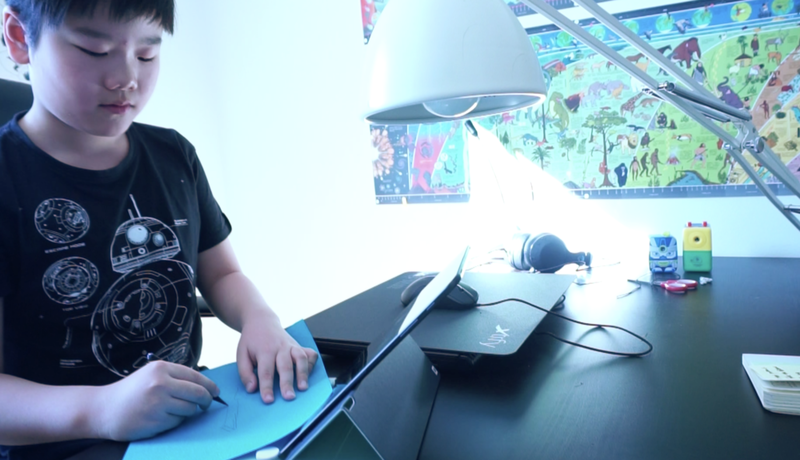 Merging virtual and reality(AR experience) excites kids and engage them to draw on the paper. I designed different characters in the game to support children along their way of learning and playing and encourage them to draw more. A main storyline has been designed to enable children to learn through playing. 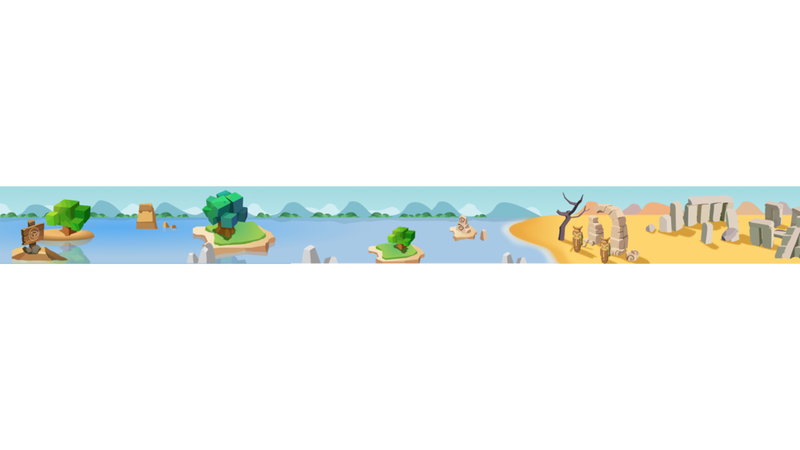 The game UI is matching the game style, and make the learning programme more playful. The functional prototypes were built in both Principle and Origami Studio.